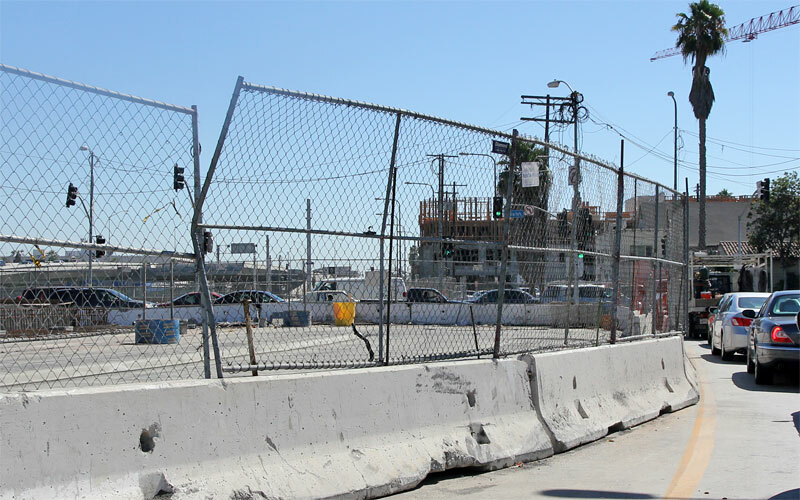 1/30/11 — Most of the K-rails and construction fencing were gone from the bridge earlier this month, and the parapet wall is finally finished. 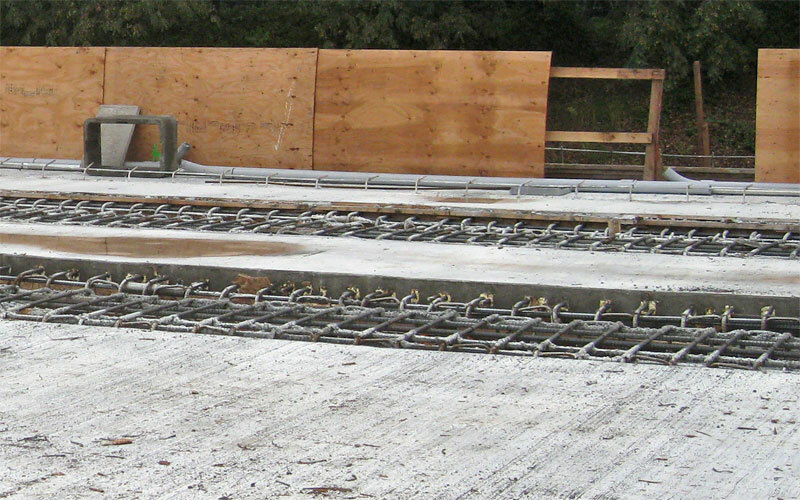 12/9/10 — Work continues on the Flower bridge north of Adams. 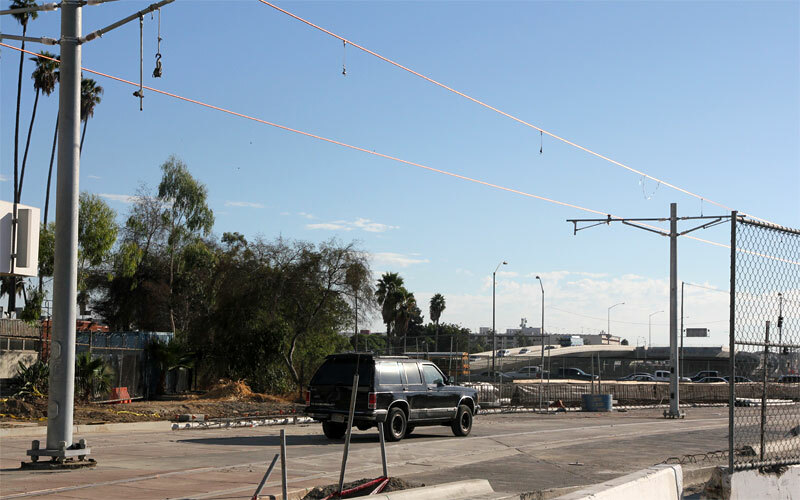 9/30/10 — Catenary installation continues along Flower with hangers being put on the messenger wire on the Harbor Freeway bridge. Note the partly finished curb between the trackway and street at the bottom. 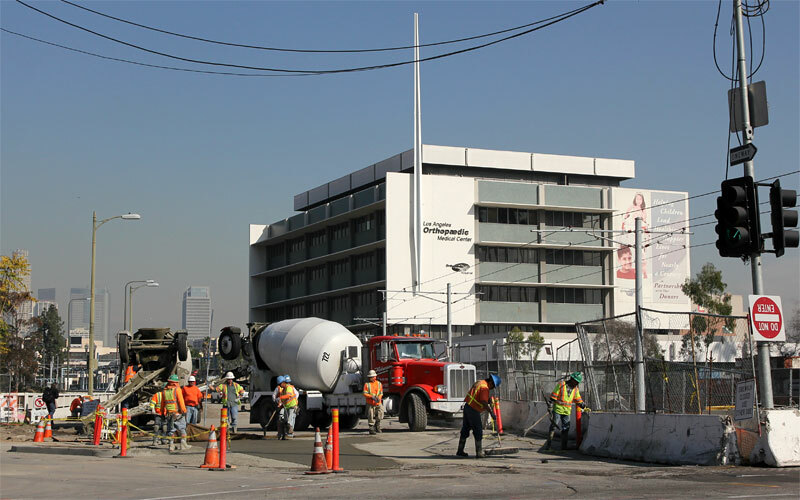 9/2/10 — OCS poles are being erected across the Flower Street bridge over the freeway. 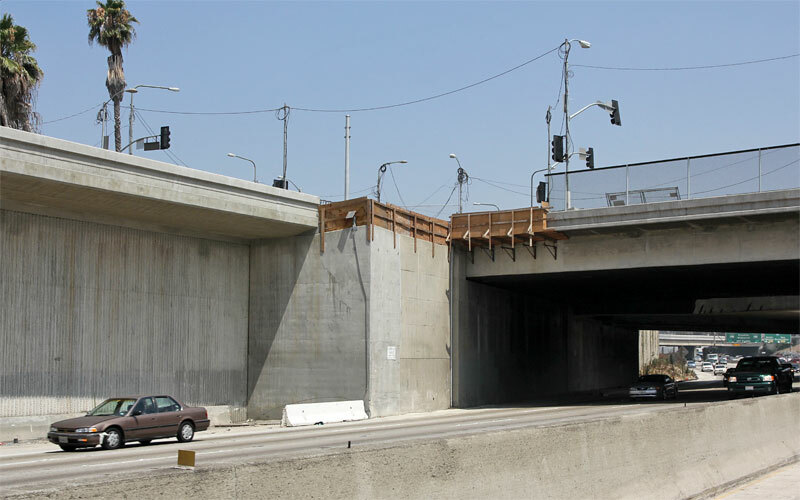 8/20/10 — This late construction view south on the Flower Street bridge toward Adams Boulevard should change soon. The curb ending below the yellow barrel between tracks and street is new, and the concrete road surface appears ready for traffic. 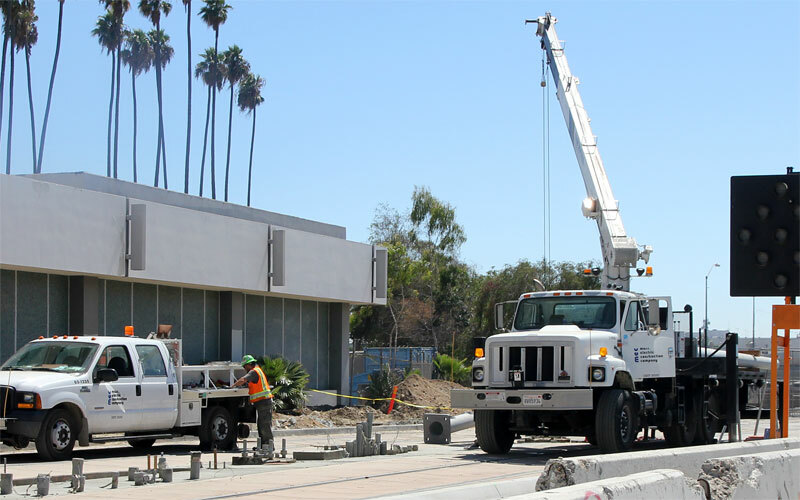 Farther south Flower has its finished three traffic lanes from curb to curb. 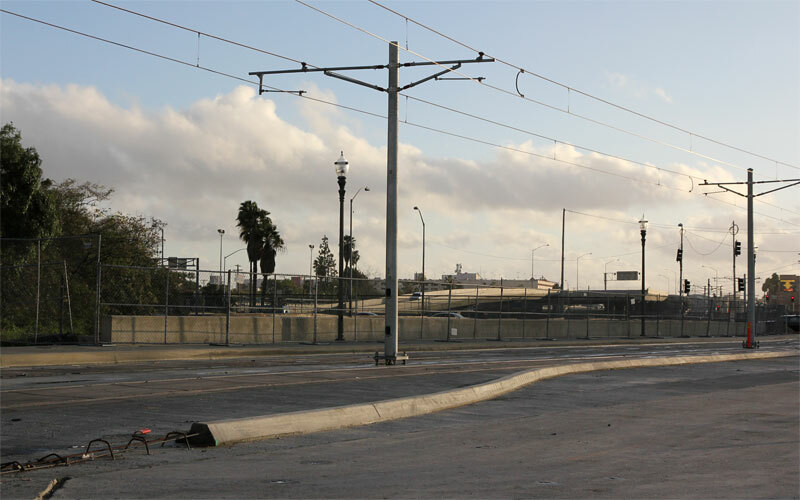 Left of the yellow barrel is a catenary pole; poles are continuous up to here. 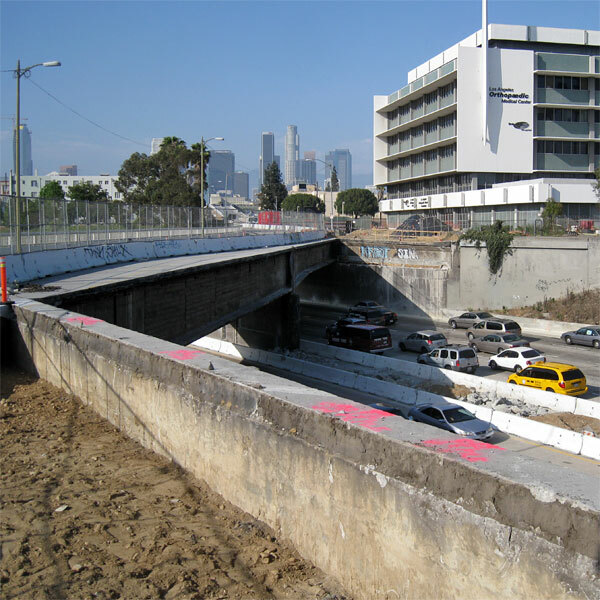 8/6/10 — The parapet wall between the Flower Street cantilever (left) and the Adams Blvd. 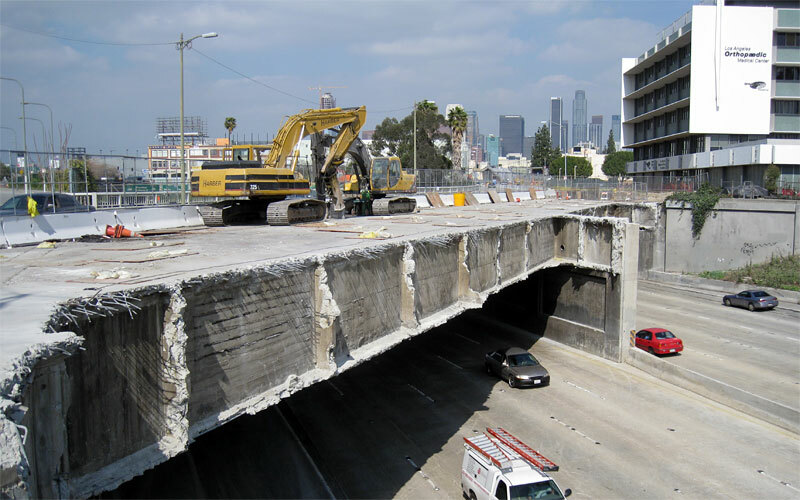 bridge over the Harbor Freeway is being finished. 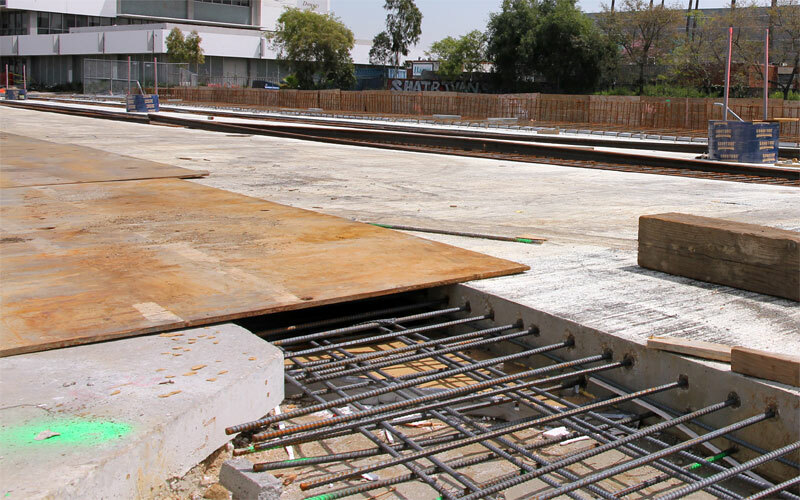 4/15/10  Rails have been staged on the Flower Street bridge and 23rd Street station north of it, getting ready to finish the remaining gap between the rails from Adams Blvd. 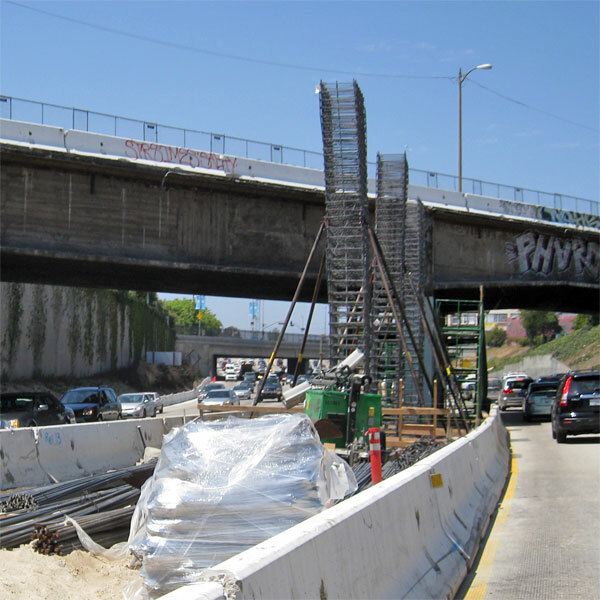 to Buckingham Ave. and north of 23rd St. You can also see rebars for the bridge parapet (background) and filling the gap between the old and new bridges (foreground). 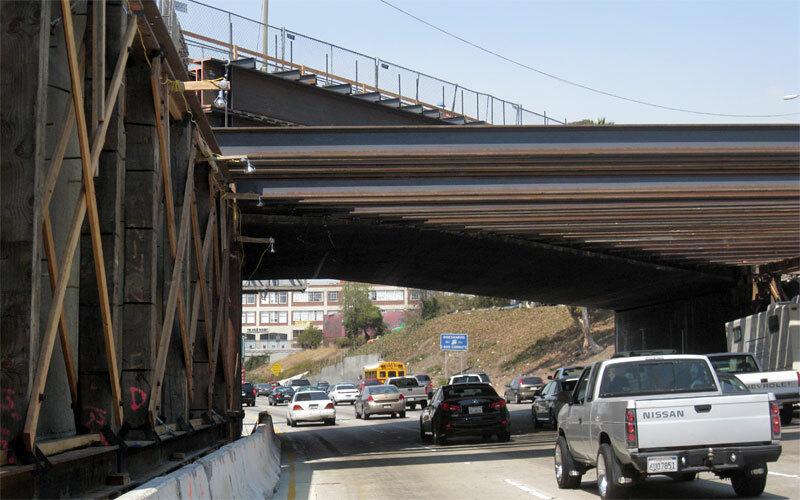 1/5/10  The Flower Street bridge falsework and forms have been removed. 12/11/09  The concrete bride deck is complete except for the track areas. 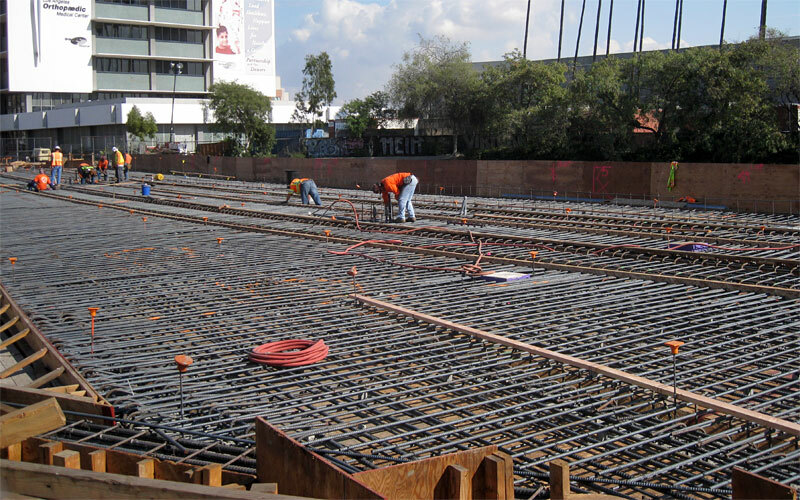 11/13/09  The top rebar on the Flower Street bridge over the Harbor Freeway appears nearly ready for concrete. 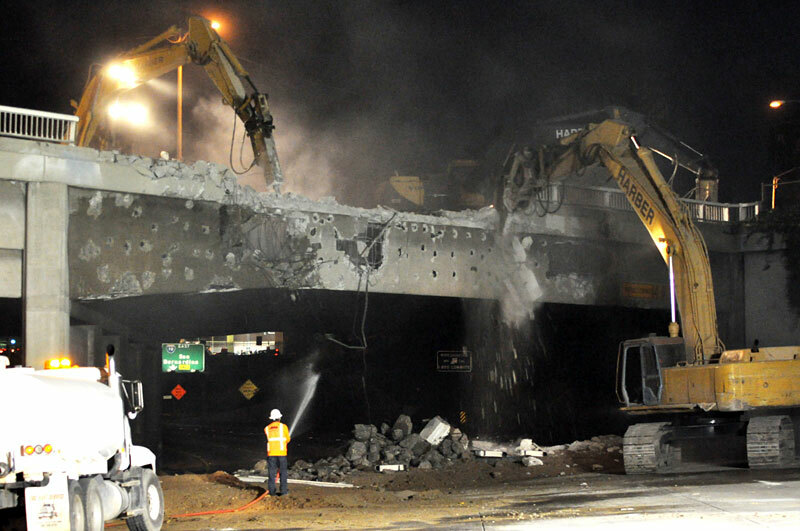 10/24/09  The bottom and sides of the Flower bridge are poured, and forming is beginning for its top deck. 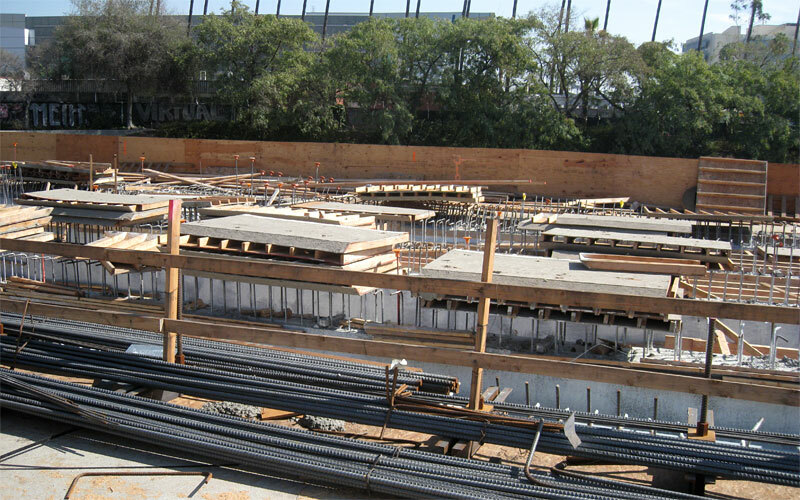 9/20/09  Plywood forms are complete and rebar is underway for the new Flower Street rail bridge over the Harbor Freeway. Far right is the end of the existing Adams Boulevard bridge. 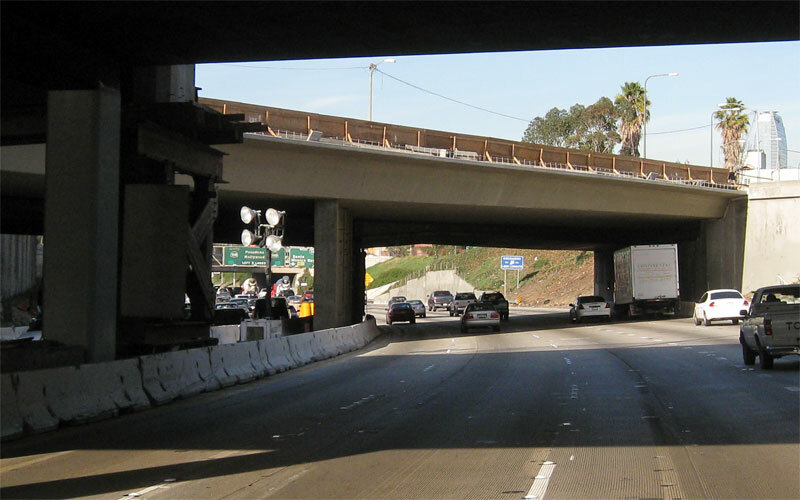 9/3/09  Falsework for the new bridge is going up over the Harbor Freeway. 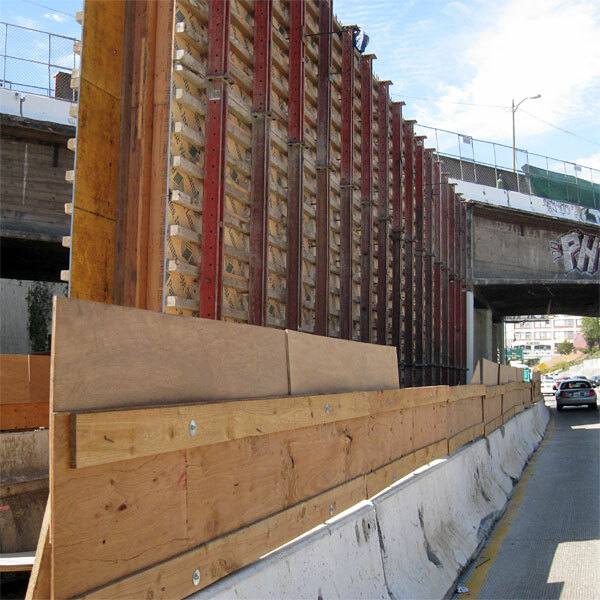 8/4/09  The forms are up for the Flower Street bridge's center column in the Harbor Freeway. 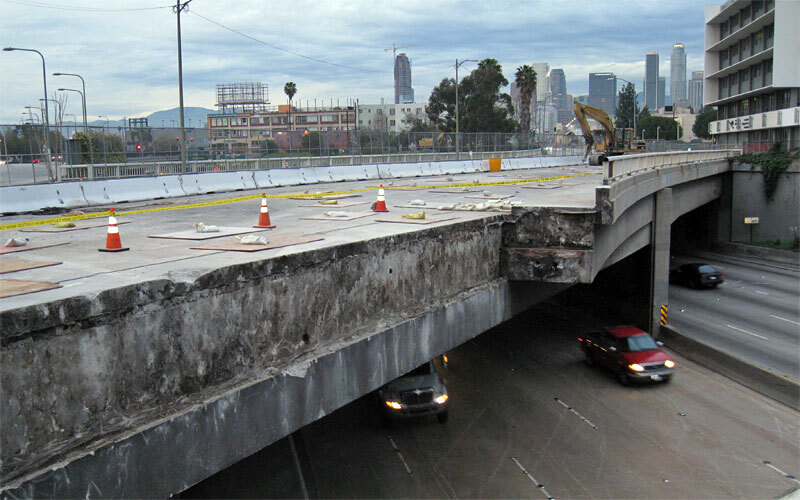 7/3/09  With footings complete the rebar cages for the Flower bridge's columns in the median of the Harbor freeway are starting upward. 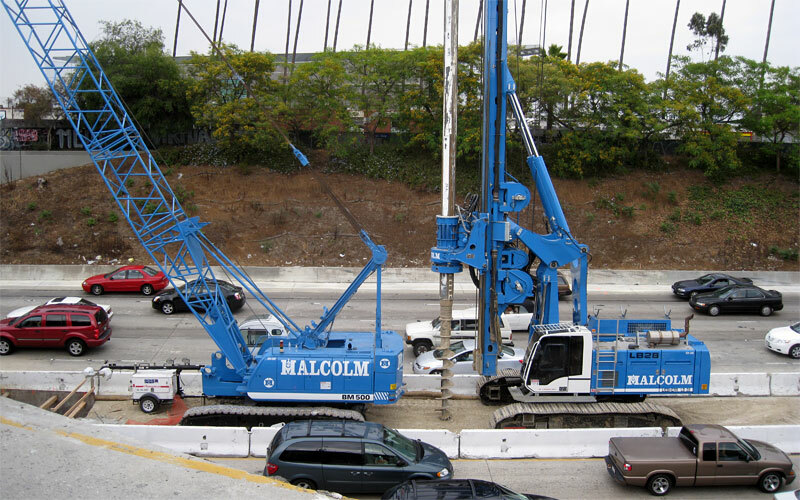 6/9/09  Drilling new CIDH (Cast in Drilled Hole) piles in the median of the Harbor Freeway for the new center columns. 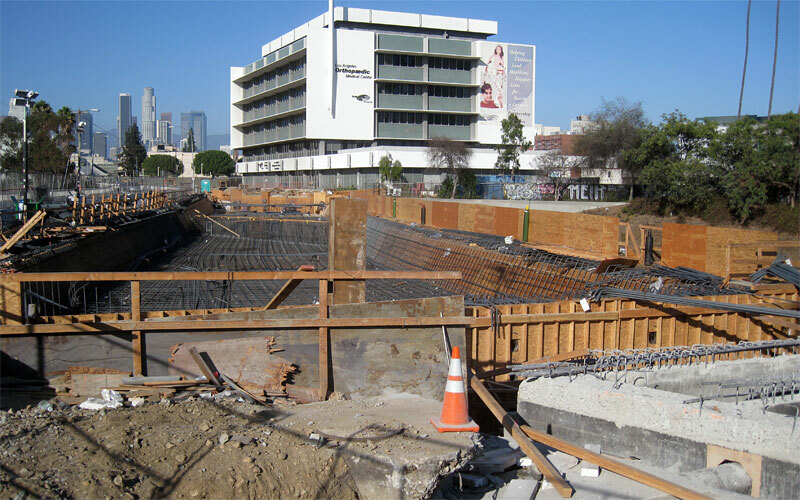 5/17/09  Center pier is gone, CIDH piles are in place for the north abutment, and about to begin for the south abutment. 3/2/09  All gone except for the pier. 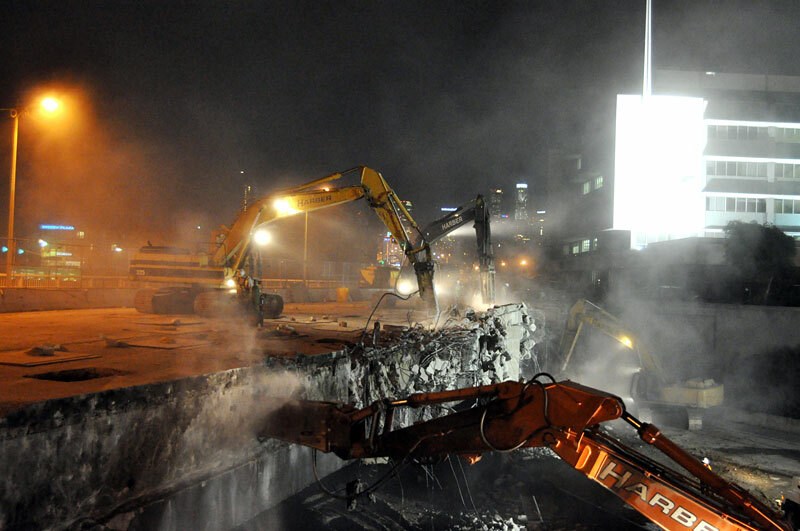 2/23/09  Second night, looking like a scene from War of the Worlds (photos copyright Expo Authority). 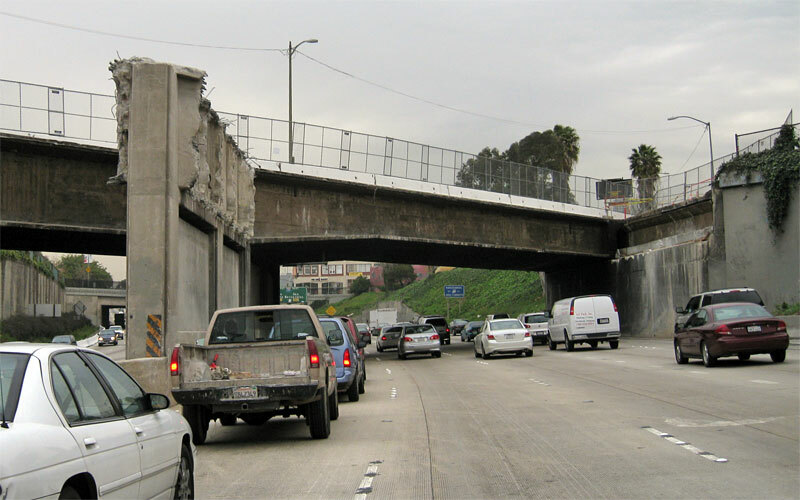 2/22/09  The eastern half of the Flower Street bridge over the Harbor Freeway (I-110) is being demolished, to rebuild the the bridge to support the Expo Line light rail tracks. The freeway was closed five nights after midnight. Above is after the first night's demolition.